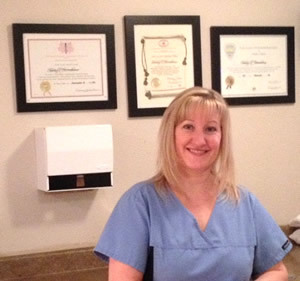 Electrolysis by Shelly is located in Chilliwack BC, Canada. You can find us on a map here and contact us anytime to answer any questions you might have. I have been interested in electrolysis since 1987. I trained and became a certified Electrologist in 1993 and joined two industry associations: PSPE and COPE. In the same year, I began to work for a small spa on Young Street that offered massage, nails, facials, pedicures, and electrolysis. Months later, I decided to buy my own equipment and rented a small space in a hair salon in Chilliwack. In 1995, I moved my practice to my home where I was able to build a serene studio that best suited my clients’ needs. In 2003, I trained in the use of laser for hair removal and vein treatment and have been thrilled with its capabilities and results. From there, I became interested in skin care and age-defying treatments where I conducted research on the different modalities available to rejuvenate the skin. Looking for a treatment that was natural and worked hand in hand seamlessly with the body, I found the microcurrent therapy would do just that. Its anti-aging, body contouring and healing properties are just some of the benefits I am now able to offer my clients. 2004 Vascular Laser Workshop with Stellar Laser Technologies Inc.
2008 comprehensive hands-on training from Cynocure with the Apogee Elite Aesthetic Laser System for sun damage, brown spots, freckles and skin rejuvenation. I believe knowledge and information are the best tools I can give my clients for their own continuing care and participation in the process of their own renewal and rejuvenation. Contact our studio at any time and we will be happy to show you around our studio and discuss which products and services would best suit your needs.